Delta smelt are the endangered species most often blamed for water export cutbacks in the Sacramento-San Joaquin Delta. But the latest cuts were triggered to protect salmon, a reminder that there’s a lot at stake in California’s complex plumbing system. A major change took place in California water operations this week, but you probably didn’t hear about it. Federal wildlife officials ordered cutbacks in water diversions from the Sacramento-San Joaquin Delta to protect salmon and steelhead. The cutbacks, triggered by the Endangered Species Act, mean that farms in the San Joaquin Valley and cities in Southern California will receive less water, even though the drought continues. Similar cutbacks have occurred because of delta smelt, a small fingerling fish. Water users never hesitate to pounce on those actions, often blaming the cuts – erroneously – on a “minnow” that is worthless to the state in an effort to gain political advantage. Water diversion cuts to protect salmon, on the other hand, receive very little attention. 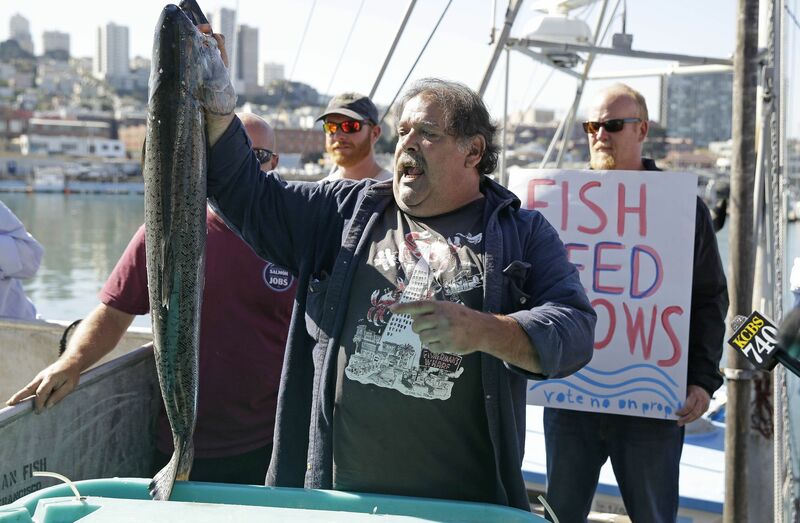 “It does seem they’ve made a choice not to mention salmon when they talk about pumping restrictions,” said John McManus, executive director of the Golden Gate Salmon Association, a group that represents the salmon fishing industry. That may be because salmon play a crucial role in California’s billion-dollar fishing industry. People know salmon are part of the state’s economy. They buy it at the market, they spend their recreational time trying to catch it and they build gourmet menus around it. In other words, it can’t easily be scapegoated for our water-shortage problems. The water cutbacks to protect salmon are a reminder that California’s water supply challenges are far more complex than a tiny delta smelt that most people have never seen. The state’s heavy thirst for water affects whole ecosystems, including creatures like salmon that occupy our imagination and our dinner plates. The order to reduce Delta water exports came on April 1 from the National Marine Fisheries Service, the agency charged with protecting three runs of salmon as well as steelhead in the Central Valley. The particular goal in this case is to prevent Central Valley steelhead from being sucked to their deaths in the water export pumps operated by the U.S. Bureau of Reclamation and the California Department of Water Resources. But it also helps spring-run and fall-run Chinook salmon. The young of both species are currently migrating to the ocean and are also at risk of being drawn into the pumps. Spring-run salmon, an endangered species, are the last race of Central Valley salmon with a significant population component that spawns in the wild. This primarily happens on three creeks flowing out of the Northern Sierra Nevada in the vicinity of Chico: Butte, Mill and Deer creeks. Poor snowmelt runoff in these creeks caused by the drought has meant the spring-run salmon population took a huge hit in the last two years, based on a tally of carcasses found after spawning. Because salmon typically return to spawn after three years in the ocean, that means this year’s juvenile spring-run population could be crucial to sustain the species. So actions to protect those juveniles are very important, said Maria Rea, Sacramento regional administrator of the fisheries service. For instance in 2012, surveyors counted 26,317 spring-run salmon carcasses in Butte Creek. In 2015, they counted only 413. Until April 1, the state and federal water pumps in the Delta were exporting the maximum allowed in order to take advantage of decent runoff from recent storms and the start of spring snowmelt. The order to protect steelhead cut that by more than half, and it could continue through the end of May – the period deemed most crucial to migrating salmon – although the rule does allow for adjustments if conditions change. This does not sit well with water users. Mike Wade, executive director of the Farm Water Coalition, criticized the latest Delta water pumping reductions, especially coming after last week’s announcement by the U.S. Bureau of Reclamation that farm irrigators on the West side of the San Joaquin Valley will get only 5 percent of their contract water allocations. They were hoping for more than that, he said, given winter precipitation near average and improved allocations for other water users. Rea said reduced pumping has been shown to help salmon and steelhead. The state and federal pumps are strong enough to reverse natural water flows in the Delta. This can draw fish to their deaths in the pumps and also trick them into swimming in the wrong direction, making them more vulnerable to predators and pollution. The pumping reductions seem to be helping. In the week that they have been in effect, an estimated 26 steelhead have been killed at the pumps, compared to 129 in the prior week. But Wade criticized the latest action, calling it a crude tool driven solely by the calendar. The rule requires pumping reductions from April 1 through May, he said, simply because this is the period when steelhead are usually migrating. The Endangered Species Act rules do contain a number of other requirements to improve salmon habitat that has been degraded over decades by land development, dam building, water diversions and pollution. These measures take years to carry out, but may eventually minimize the need for pumping reductions. Fall-run Chinook salmon are not protected by the Endangered Species Act, but are important for another reason: They are the primary species caught by commercial fishermen off the California coast, and thus the primary source of wild-caught salmon in California markets and restaurants. They are helped nevertheless by pumping reductions that aid spring-run, because they migrate toward the sea at the same time. All these fish have to pass through the Sacramento-San Joaquin Delta, the distribution hub for freshwater serving 25 million Californians and 3 million acres (1.2 million hectares) of farmland. They have to pass through the Delta twice – when they migrate downstream as juveniles, and when they return three to four years later to spawn as adults. Matt Weiser is a contributing editor at Water Deeply. He can be reached via email at matt@newsdeeply.org or via Twitter at @matt_weiser.